Going vegan can be daunting and overwhelming, especially when you don’t know anyone else who is transitioning. But don’t worry – it is easier than ever before with veganism becoming increasingly mainstream as more and more people discover the benefits of living this way. I have been vegan since 2014 and since then, I have learned a lot about myself and about the way non-vegan people see this lifestyle. In this article I am going to share with you my top 14 tips for going vegan. I genuinely hope these tips will make your transition easier, if you choose to venture into the magical world of veganism. The first thing you need to do is to ask yourself why you want to go vegan. Is it for your health? For the animals? For the planet? For everything? If you’re not sure why you want to go vegan yet, you can read my post Why Choose Vegan. Knowing exactly the reason(s) why you want to go vegan is going to help you during the transition. It is going to help you focus on what you actually GAIN by going vegan instead of focusing on what you think you are losing. For example, instead of thinking about that meal that you love but that you “can’t” have anymore, the why let’s you focus on the gains, like improved health, a better environmental footprint and a clear mind knowing that no animal had to die in order for you to eat. I always get a bit frustrated when people tell me “oh, you can’t eat that, can you?”. Well, I can eat that but I CHOOSE not to. Going vegan is a choice and should not be seen as a restriction. There is not a single dish that can’t be made vegan today, so don’t worry about that. Eating vegan doesn’t have to be expensive. In fact, it is actually cheaper because legumes are way less expensive than meat. Of course if you buy vegan meat and cheese substitutes it will cost you a bit more money, so I recommend that you stick with whole, unprocessed plant foods if you’re on a budget. You’re going to have fun eating vegan! I mean, I’m still not tired of Vegan Pizza, Snickers Bars, Caramel Donuts, High-Protein Mac and Cheese and Vegan Tacos. No, you are not going to die from protein deficiency provided you are eating a balanced vegan diet (but that applies to every diet, right?). By transitioning to a vegan lifestyle, you are choosing to take care of your body, to save animals, the environment and so much more. In four years, I have saved: 6,079,294 liters of water, 26kg of grain and 1,460 animal lives! If you are already vegan, you can calculate how much you have saved here. This is probably the best tip I can give you. Do research on the Internet, watch documentaries and videos, read books and studies about veganism – educate yourself. You will be surprised by the amount of information you will learn and this will make you excited and passionate about the topic. The more you know about veganism, the easier it is going to be for you to answer questions from people in your social circle. You want to be prepared, believe me on this one. 😉 When I went vegan, I had to deal with positive and negative questions, comments and “advice” from people who became doctors and dietitians as soon as they heard about my decision to go vegan. I know how frustrating it can be not to have enough knowledge and facts in mind to back you up and answer questions when you are deeply convinced of the legitimacy of your choice, so educate yourself. Who knows, maybe someone will be inspired by your decision and will want to transition with you. You are entering a whole new world, so be curious and have fun learning and experimenting new things, like trying new recipes and new products. Nowadays, with social media, going vegan is easier than ever before. Google, YouTube, Pinterest and Instagram are packed with advice, ideas and information that will help you transition. Did you know that any dish can be made vegan? Any dish. You won’t feel like you are missing out on anything, because you will still have the ability to have vegan burgers, nachos, sushi rolls, lentil dhal, burritos, hash browns, chili, pad thai, spaghetti bolognese, shepherd’s pie, pizza, lasagna… As well as desserts like chocolate mousse, lemon meringue pie, pancakes, brownies, waffles, ice cream, cheesecakes, cookies, chocolate donuts, blueberry peanut butter donuts, carrot cake, cinnamon rolls, cookie dough bites… The list goes on and on. However, keep in mind that you don’t have to try and veganise “traditional dishes” if you don’t want to. You can literally bake whole sweet potatoes, stuff them with guacamole, sweet corn and fresh cilantro, and call it a meal. This is what I love about the vegan lifestyle – it is so simple. 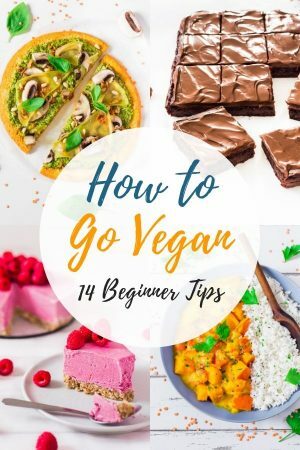 If you think you need a little help to get you started, Lars and Alena from Nutriciously have put together a Vegan Starter Kit which includes 40+ easy plant-based meal ideas that everyone can make, as well as a 14-day meal plan, a restaurant guide to help you eat vegan in any restaurant, and more! They also have a special offer on their Ultimate Bundle which includes their Vegan Starter Kit and their Sustainable Weight Loss System. If you buy the bundle, you get 50% off the Sustainable Weight Loss System. When I first went vegan, recipe ebooks helped me tremendously to find new recipes to make for my family and I. You slipped up? Don’t worry. While some people will become vegan overnight and never look back, others will need a longer period of time to transition, and that is okay. Think about it: you are re-configuring habits you have lived with your whole life! If you are eating out, I would advise you to always ask and double check if the dish you are about to eat or to order is vegan. Sometimes people forget about your diet and you can end up accidentally eating something that contains eggs for example. It is very frustrating, but when it is done there is nothing you can do about it, so pay extra attention. If you make a mistake, it’s okay. Learn from it and move on. Oftentimes, people who are transitioning to a vegan lifestyle do not eat enough. Keep in mind that whole plant foods are lower in calories than animal-based foods, which means you need to eat more to be satisfied. If you are not eating enough, you are not going to feel your best and you are going to crave those dishes you were used to. So listen to your body and eat until you are satisfied. Remember that veganism is an eat-in-abundance lifestyle, not a deprivation diet. You can still have some treats when you feel like it. 😉 Take advantage of the many mock meats and vegan cheeses available in most supermarkets if you feel like it is going to help you transition. If you have made the decision to go vegan, get rid of animal products. Those products do not need to be in your house. If you live with someone who is not vegan and you are the only one making the transition, consider having a separate pantry to store your vegan products; this way you won’t be tempted by the food that you grew up on. Surround yourself with like-minded people or at least with people who support and encourage you. If you don’t know anyone who is making the transition, you can interact with like-minded people on Instagram – who knows, you may even make real-life friends like I did! Don’t feel like you have to do it all at once. When they first learn about veganism, some people also want to become zero waste and minimalist overnight. If that’s the right approach for you, that’s great. But don’t be concerned if you need more time, or if you are simply not ready for these lifestyle changes yet. One step at a time. Yes, supplementing vitamin B12 is recommended. The vegan diet can be one of the healthiest and receives nowadays more backing than ever before from doctors and nutritionists from all over the world, though vitamin B12 is the only nutrient that is almost impossible to obtain from this diet. The Vegan Society recommend the following for oral supplements: at least 10mcg daily or at least 2000mcg weekly. I have been using this brand since I went vegan and I love it. In my opinion, the best way to share the vegan message is to live by example. You are not going to inspire anyone to go vegan by judging them or making them feel bad about their eating habits. However, people are likely to be interested in your lifestyle if they see how happy and healthy you look and how passionate you are about it. Veganism is not just about showing compassion to animals, it is also about showing compassion to other human beings. My favorite way to share the message is by making delicious vegan recipes and sharing them with people. They are often surprised at how tasty vegan food is and I couldn’t be happier about it. This is optional, but getting a blood test done before you transition to veganism and another one after 6 months to 1 year can help reassure you and your family circle. For example, if you have cholesterol or blood-pressure issues, you may see an improvement in those areas. Remember that if done correctly, there should be no deficiencies following a whole-foods, plant-based diet. Another important tip I can give you is to experiment and find what works best for you. Do not blindly and strictly follow what someone says on the Internet – just because it works for them, does not mean it is the right thing for you. Trust me, I learned the hard way. Whether you want to eat fully raw, fully cooked or a mix of both, high carb or a bit higher in fat, do it because it makes YOU feel good. Your body knows best. WHAT IS THE BEST TIP YOU WOULD GIVE SOMEONE WHO WANTS TO TRANSITION TO VEGANISM?